“Stasis” Magic card, art by Fay Jones. The other day, our friends at BoingBoing alerted us to a deck of Science Tarot cards, produced by a collaborative group of “post-doc scientists, experienced tarot readers, graphic designers and published artists.” I’ve never had a tarot card reading before, but the BoingBoing post got me thinking about how much I like cards in general, and how they’ve pretty much always been a part of my life. I credit my late grandfather David for that. He was a master bridge player, so for him cards were serious business. But when we were kids, he also delighted in pulling out a dog-eared deck of playing cards—some bearing the logos of airlines, others labeled with the word “Bicycle”—and letting us beat him at Gin Rummy or a game he called Chinese, whose rules, alas, I forget. As I got older, another type of card entered my life—the rock ‘n’ roll postcard. Based on posters for rock concerts, these postcards were either mailed to would-be concertgoers or distributed in stores where prospective revelers shopped. In the San Francisco Bay Area where I grew up, that meant record stores, book stores, and head shops in the Haight Ashbury and other like-minded neighborhoods. I was on the Fillmore West’s list for about a year, but not all of the postcards I received in the mail survived my childhood. 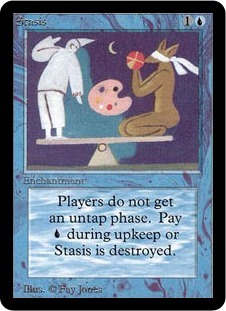 Fay Jones created the art for Stasis, one of 295 cards in the game’s Alpha series. After we had kids, our oldest son, Sam, introduced me to a new type of card, the kind used in a popular trading-card game called Magic: The Gathering. At first Sam just played with his cards, wrapping them with rubber bands and storing them in cardboard boxes or paper bags. Quickly, though, as he became more aware of the monetary value of his cards, which were becoming very collectible, he took to sleeving his cards in plastic and playing with them that way, lest their edges got dinged and worn with use. In the mid-1990s, two magical Magic events occurred in our lives. The first was an assignment from a magazine to interview Richard Garfield, the then Whitman College mathematics professor who had designed MTG, as it is sometimes called. The idea for the article was to fly to Seattle, where the game’s publisher, Wizards of the Coast, was based, to talk to Garfield, get some juicy quotes, and then see how Sam would do in a game against its creator. Sam spent a fair amount of time building the best, most devastating deck he could. Garfield, who was suffering from jet lag after a flight from Japan, pulled a new starter deck off a shelf, unwrapped it, and trounced my son in about 10 minutes. The second event occurred later that evening, when we met up with a friend named Fay Jones, who just so happened to be related to Richard Garfield (I can’t recall if they were cousins or if he was her nephew). A highly regarded visual artist in Seattle, Fay had been asked by Garfield to create the artwork for Stasis, one of the 295 cards in the game’s Alpha series, which even then was in great demand. Fay’s reward for helping her younger relation was to periodically receive a box of cards in the mail. On the night we met with Fay, she had brought her latest package, which she handed to my son as a gift. It held a box of Antiquities, which is the name of the second expansion set in the Magic series. As the adults mingled and conversed, Sam proceeded to systematically open the dozens of Booster Packs that were in the box, each of which contained eight cards. He scored the most famous and valuable card in the Antiquities set that night, Mishra’s Workshop. As it turns out, Fay had been as fascinated by Sam’s delight in unwrapping all those cards as Sam had been in doing the unwrapping. Which may be why, later that year, Fay’s original artwork for the card arrived in the mail, with an inscription at the bottom to Sam. Some years ago he sold his complete Antiquities set (I believe a collector in Europe paid $850 for it on eBay), but Fay’s artwork, along with two versions of the card it became, is framed on his bedroom wall and is very much not for sale. Love your article! I started a website called: http://www.mtgstores.com and would love to discuss more about this with you. Our Artist Corner on the Community section of our site showcases the MTG Artist. Quite a few people have wondered where that art has gone since that was the only piece that Fay ever produced for Magic. I personally happy that it’s in a home that it’s cared about instead of locked in a box somewhere. Stasis has the best art! Too bad Fay hasn’t done more cards. I’m envious of your son, but very happy for him for having my favorite piece of artwork in Magic. “ ” We forget that technologies are actually reflections of our values and our desires, and they co-create one another.